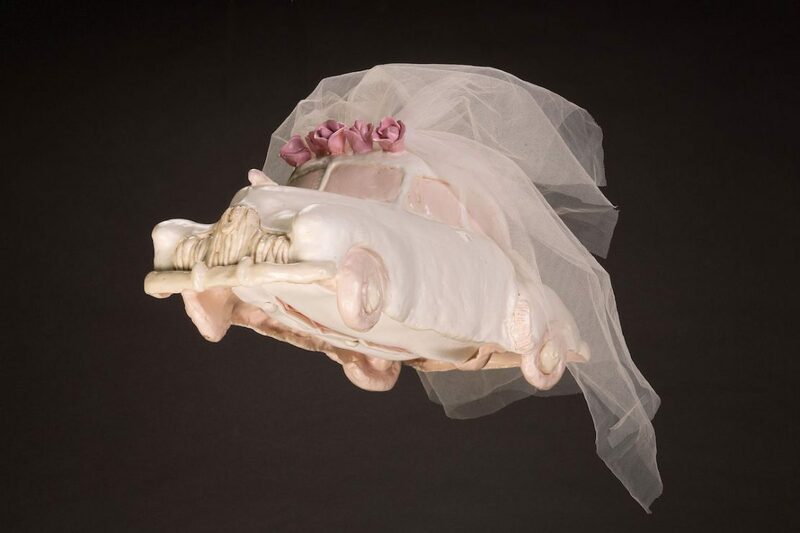 Margaret Dodd, Bridal Holden, 1977, ceramic sculpture, 24 x 42 x 20 cm. Courtesy the artist. Photograph Clay Glen. 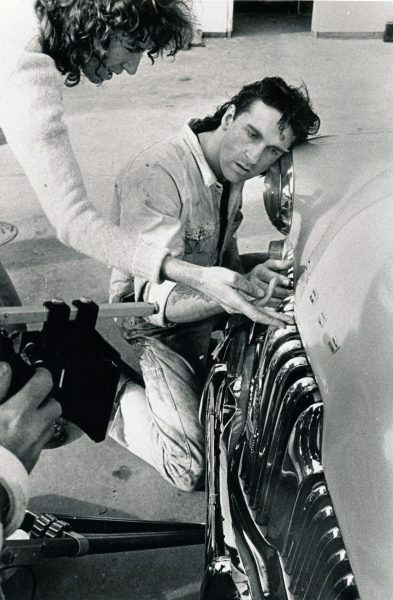 Margaret Dodd directing Phil Colson, This Woman is Not a Car, 1976. Photograph Doug Nicholas. Margaret Dodd, Ancestral Figures – Holden Hypotheses series, 1976-77, ceramic sculptures, dimensions variable. Courtesy the artist. 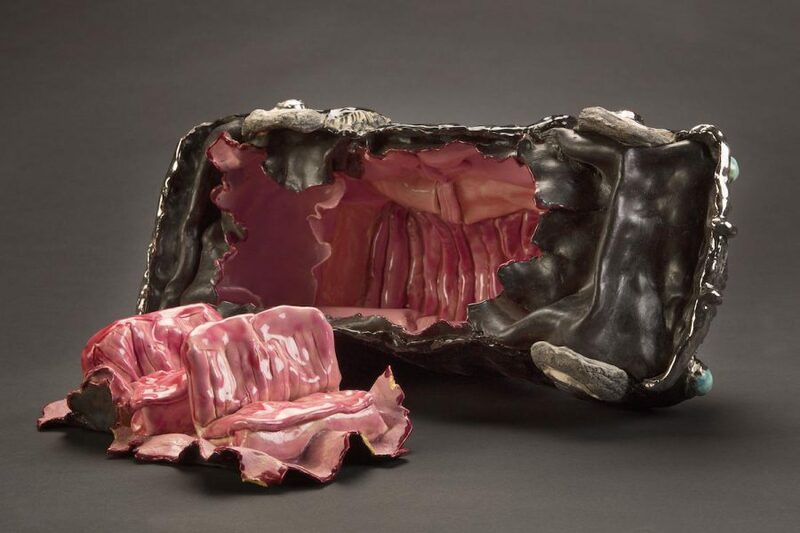 Margaret Dodd, Hoon Holden, 1977, ceramic sculpture, 18.5 x 42 x 18.5 cm. Courtesy the artist. Photograph Clay Glen. 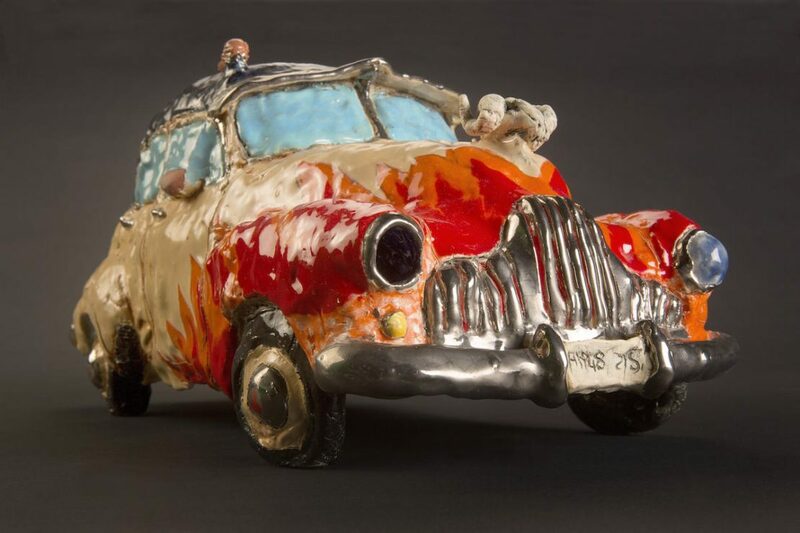 Margaret Dodd, Ravaged Holden, 1977, ceramic sculpture, 21 x 42 x 42 cm. Courtesy the artist. Photograph Clay Glen. 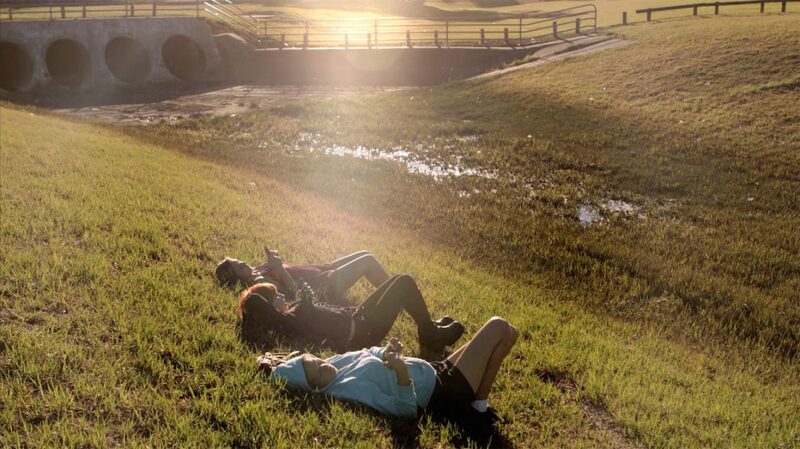 Kate Blackmore, Girls, 2015, dual channel HD video, 21 mins 15 secs. Courtesy of the artist. Kate Blackmore, Girls, 2014, dual channel HD video, 21 mins 15 secs. Courtesy of the artist. 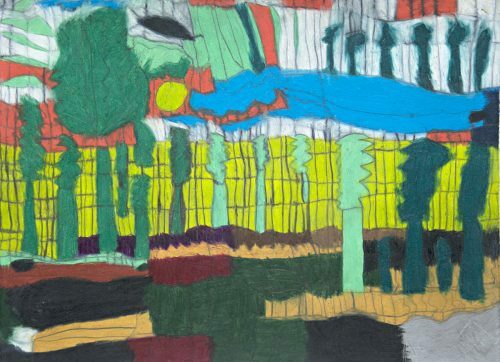 The exhibitions are showing as part of FRAN FEST, a South Australian festival which explores the historical push of second wave feminism, as well as contemporary feminism and current art practices. 2017 marks the first year of FRAN FEST, which was created to celebrate the 1977 exhibition The Women’s Show at Experimental Art Foundation (now ACE Open). 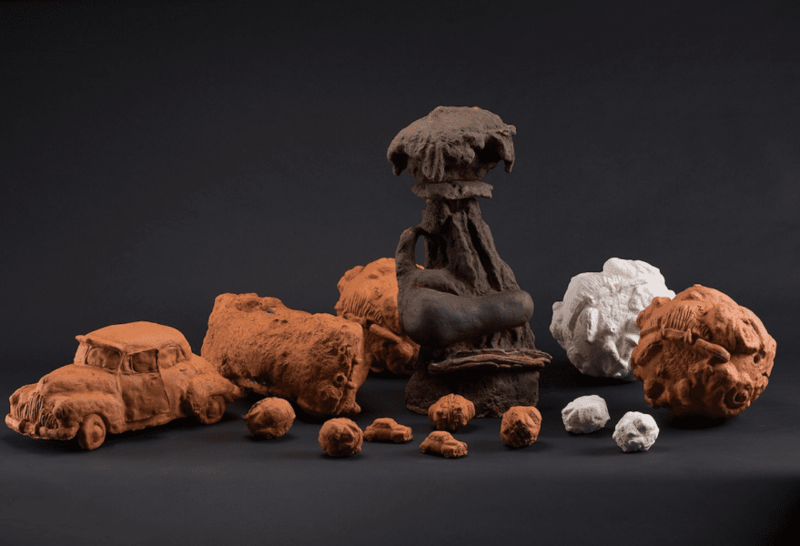 Originally exhibiting at The Women’s Show, Dodd is now presenting her ceramic Holden sculptures from 1977 alongside her 1982 film, This Woman is Not a Car. 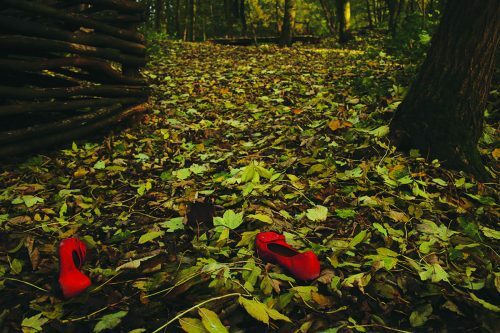 The works look at representations of women in suburbia, considering the links between fantasy, eroticism, fetishism, masculinity and violence. As ACE Open curator Toby Chapman explains, “Dodd’s audacious film and ‘funk ceramic’ Holdens explore femininity and the maternal against a backdrop of the burgeoning suburbs of northern Adelaide.” Curated by Susan Charlton, the exhibition also features archival material as well as Dodd’s recent works. Blackmore’s 2014 documentary, Girls was created over 40 years. Despite Blackmore’s different take on women in suburbia, her experimental documentary is placed within an intergenerational conversation with Dodd’s work. Yet when capturing the experience of the four young women coming into adulthood, Blackmore is more focussed on the hope of future opportunities. “Blackmore beautifully captures the tenacity and strength of these girls as they speak about their ambitions and desires to break the cycle of social disadvantage that seems to have dictated their lives,” says Chapman. 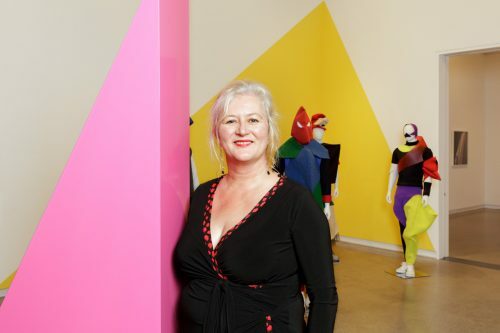 One of Melbourne’s iconic public galleries, Heide Museum of Modern Art, announced this week that Dr Natasha Cica has resigned as director. In Brooke Leigh’s video Searching For Alice, 2015-2017, scenes of a deciduous forest bereft of leaves are interspersed with close-up shots of a young woman’s mouth.